Summer is on its way and with it comes scorching temperatures that can turn your home into an oven. A reliable air conditioning system becomes far more than a luxury during the summer months in Southern California. Most homes in our neck of the woods used centralized air conditioning, which generates cool air in a single location, then distributes it into your home with a series of ducts. It works quite well, but some homes aren’t suited for it. If yours was built before the advent of air conditioning, for instance, it might not support the ducts required for centralized systems. There might be some architectural design that can’t support the ducts either, and some homes that possess centralized air might not be making effective use of it: leading to uneven heating and issues like cold spots. Ductless systems provide an excellent solution to homes facing this dilemma. If you need a new system and centralized air just isn’t an option, look into a ductless system as an alternative. You may be surprised at the results. Centralized systems work by generating the air in a single space. 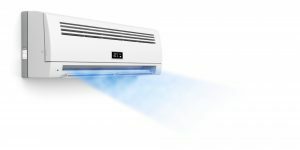 Ductless systems, on the other hand, adopt a decentralized format: installing multiple units throughout your home to cool different sections. Accordingly, you can raise or lower the temperature in each section individually. Dustless systems tend to cost more to install than centralized systems, since you need to place them in multiple locations, which is why they’re not as common as they might be. But the benefits they provide are considerable. The first and most obvious benefit to a ductless system comes in the title: there are not ducts for you to worry about. That gives your home comprehensive air conditioning without having to rely on rickety window boxes or ducts that your crawlspace simply can’t support. Beyond that, however, ductless systems provide two distinct, and intertwined, benefits. Firstly, you can set different temperatures in different parts of the home: allowing family members to be comfortable even if they have wildly different ideas of what “comfortable” means. So you can work in the kitchen over a hot stove, for example, while another family member watches TV in the living room without either you boiling or the other family member freezing. More importantly, ductless systems allow you to shut off the air in parts of the home you aren’t using – such as bedrooms or upper stories during the day, when they are not occupied – while still running the air in the living room or other parts of the home that are being used. It allows you to enjoy cool, comfortable temperatures during even the hottest days while cutting down on your overall air conditioning use considerably and saving tons of money in the process. This works especially well for larger homes, or for households whose children have grown and left the nest. It also works well for hospices, boarding homes, or any household with a large number of occupants. For quality ductless air conditioning service in Whittier, CA, call Greenleaf Heating & Cooling today!